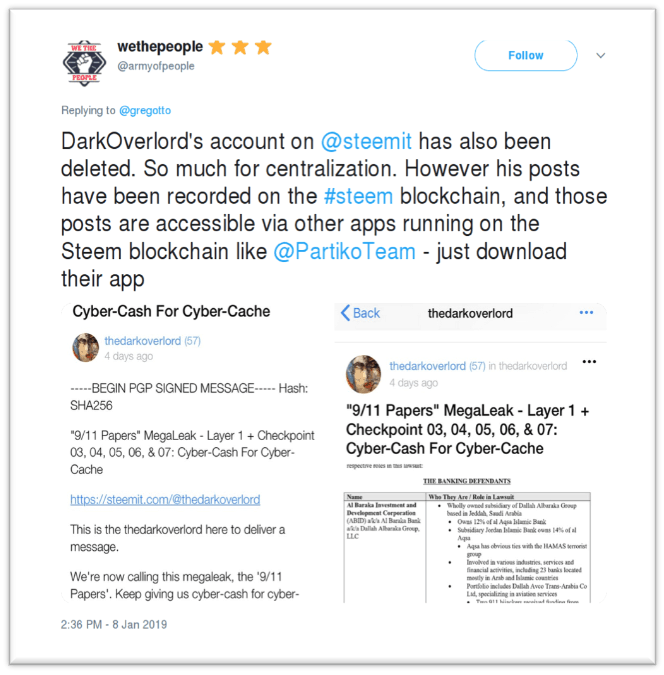 On 31 December 2018, the notorious extortion actor known as “thedarkoverlord” announced on Twitter and Reddit that they were in possession of highly sensitive documents associated with the 9/11 attacks in the United States. The group claimed the documents had been sourced from a breached law firm, and they used the social media channels to advertise their desire to release these documents into the public domain, as long as they were financially rewarded in ‘internet money’. Following a flurry of posts, thedarkoverlord was banned from both social media services, forcing them to rethink their strategy and move to the blockchain service, Steemit. However, the group have now also been barred from Steemit, prompting uproar among various online communities over what has been seen as the decision to enforce censorship on a decentralized, blockchain-based platform. This blog will look at what led Steemit to ban thedarkoverlord, what fellow users have said in response, and how this might affect the future of decentralized platforms and cybercriminality. Steemit is a social media platform built on top of the STEEM blockchain network and adopts the cryptocurrency to incentivise users of their service. Steemit publicly declared themselves a censorship free zone when they first appeared on the social media scene back in 2016; it claimed the use of the blockchain allowed Steemit and its userbase to be protected from “centralized controls” such as post moderators on Twitter and Reddit. The continued presence of the ‘Shadow Brokers’ on Steemit is often cited as an example of the platform’s liberal attitude, with the group’s posts relating to alleged Equation Group toolkits still publicly available on the site. Following thedarkoverlord’s insistence to publicize the exfiltrated 9/11 documents, both Twitter and Reddit subsequently banned the user on 3 January 2019. In an effort to circumvent these restrictions, the threat actor turned to blockchain instead and created an account on Steemit, believing they would be free from censorship and not required to abide to strict rules or regulations. However, after a day of activity and the release of the relevant documentation, the Steemit page associated with thedarkoverlord was inaccessible. Subsequent confirmation via the official Steemit GitHub repository proved thedarkoverlord had in fact been banned. The decision to ban the extortion actor from the Steemit service has been met with widespread disdain by online users. In particular, they feel let down by a service that was supposedly built on the concept of decentralization: one free from censorship. Some users could not understand the hastiness to block what appears to be legitimate data. Although many users agreed that they did not agree with the tactics and behaviour of thedarkoverlord, they felt that censorship of this type of information contradicted the very nature of the blockchain technology it was built upon. For some, this called into question if there was always going to be some form of centralized control to censor and prevent true freedom of information. Although cryptocurrencies such as Bitcoin and Steem are designed to be decentralized and free from a central, controlled authority, projects built on top of this technology do not necessarily have to be. 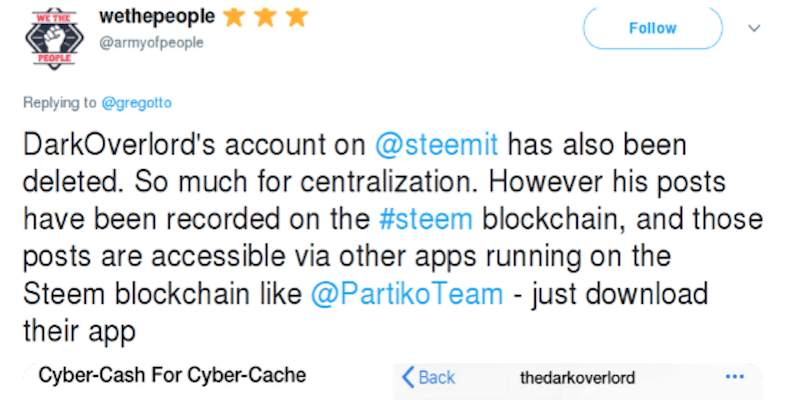 To be clear, thedarkoverlord has been banned from the Steemit platform, not the STEEM blockchain itself. Due to the inherent archiving nature of the blockchain, the information uploaded by the extortion actor is still available for viewing. Any data uploaded to the blockchain will remain, irrespective of platforms such as Steemit making them publicly unavailable. Steemit’s updated Terms of Service in June 2018 was a case and point, as when the service started to gain in popularity, the platform introduced tighter controls to somewhat restrict the information shared on the platform. And this appears to be the underlying reason for the online community’s disgruntlement: a platform which once prided itself of providing a service free from censorship is now contradicting the original premise and becoming increasingly censored. 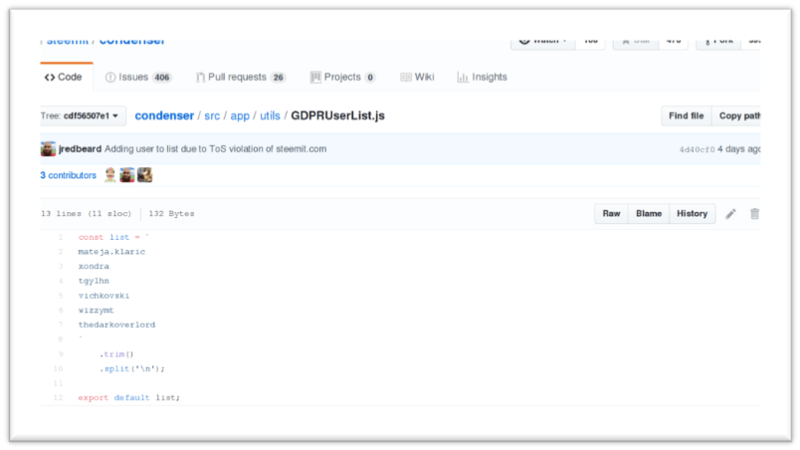 This brings into question why the service exists in the first place, particularly if it is not going to provide alternative solutions to heavily moderated environments such as Twitter and Reddit. In scenarios like the above, the extenuating circumstance is that the extortion actor was threatening to release documents that could impact the lives of US persons. However, users countered this argument, suggesting that the information already released was valuable and the move to ban the user was a threat against the freedom of information. In addition, the actions appear to be contradictory when other threat actors such as the ‘Shadow Brokers’ have previously adopted a comparable stance to thedarkoverlord – in releasing potentially sensitive, stolen data – and yet their content remains available on this specific service. Following the closure of the Hansa and AlphaBay marketplace, we reported on how many online users were experimenting with blockchain-based platforms as a means of providing greater anonymity for their activities and protection from law enforcement. In a similar shift, threat actors have also looked to platforms such as Steemit to circumvent restrictions enforced by traditional social media channels such as Twitter. It remains to be seen how much of an impact thedarkoverlord episode has in the long-term, particularly in terms of damaging user trust in self-proclaimed decentralized solutions. In the short-term at least, it’s definitely ignited some debate and lessened Steemit’s reputation. Maybe the concept of a decentralized platform does exist, but until the projects that adopt this technology settle on a consistent way to deal with the dilemma of damaging content versus freedom of information, then circumstances such as this will continue to arise. This will ultimately limit the adoption of such services. Users will ask: what is the point of decentralization in the first place if those who implement it do not enforce it? 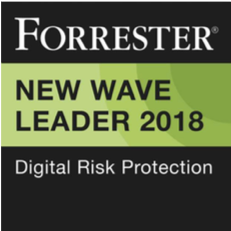 As we’ve seen in the past, trust and reputation are very fragile commodities in the cybercriminal world, and threat actors will very quickly look to other technologies to fill the gaps.